FEET head out on their first headline tour with dates including February 27 at Portsmouth’s Edge of the Wedge and February 28 at Brighton’s Latest Music Bar. 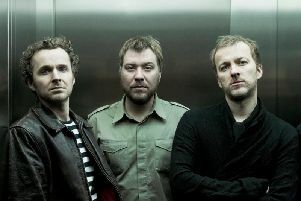 The band formed at the University of Coventry and by the time they hit the road, they will have finished recording their debut album, with a view to a release date at the end of the summer. Bass player Oli Shasha said: “We got together about two and a bit to three years ago at the University of Coventry. We were all doing different courses, and none of us was actually doing music, funnily enough. George the singer and a guy called Harry decided to form a music society because they didn’t have many people that were into the same kind of music as them, and they decided that they would try to start a band and do some music together. It was like indie, alt. They started out doing covers of things like The Libertines. I got involved a couple of weeks later. They were looking for a bass player, and it was as simple as that. We did a lot of early singles while we were finding our feet, if you pardon the pun. We put some music out there just to see what it did, and we just kept developing in the right direction through university. We have all graduated now, last June. As for the name: “Well, it is a bit of a marmite name, in a way. It was just conceived at the pub. We didn’t really know what to call ourselves, and that was one of the nonsense names that we were playing around with. We wanted something that wasn’t too serious because we weren’t taking it too seriously at the time. One of the reasons we liked it was because one of the guys didn’t like it at all. But we are stuck with it now! But actually we get more compliments for the name than we do ridicule!